This issue was severely lacking in the Tony Stark department, but made up for it entirely with some awesome developments with the characters of Pepper Potts, Maria Hill and Norman Osborn. In this issue we see Stark's reaction to Osborn's Iron Patriot, and the measures that Osborn is taking to incriminate Stark as much as he can. I really loved the press conference at the beginning of the book, where we see Osborn being a total smartass and taking control of the situation at the same time. As for the major development with Maria Hill... I won't ruin it, suffice to say that it was bound to happen sooner or later. Pepper gets the most interesting storyline, as she is put in charge of the hopelessly crumbling Stark Enterprises. The payoff is that Tony planned ahead and left her a little present that should literally get her involved in the battle in future issues. In earlier issues, Pepper was a little apprehensive about being turned into a weapon, but with Osborn threatening death upon anyone with connection to Stark, she clearly has chose to fight back. As always, Fraction's writing is above and beyond what I expect from a series like this. He's taking this character, and this character's world and really making it his own. For me, this is THE book to follow in the Dark Reign storyline, and is a worthy monthly purchase. To start things off, this issue marks a huge improvement pace-wise over the last issue of this series. It has also been revealed through Marvel's April solicitations that there will be another Ender's Game mini-series following this one that will portray Ender's time at command school. A very smart choice, as there is still alot of group to cover story-wise. This issue is heavy on the Battle Chamber scenes, and they're as beautifully done as you would expect. 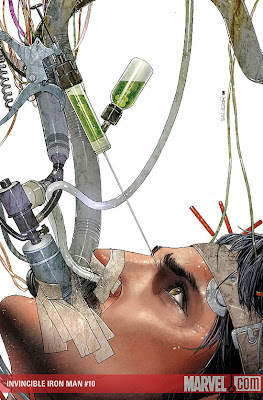 In this issue we see Ender rising through the ranks of his fellow classmates, and the the immense pressure that is being put on this young soldier. 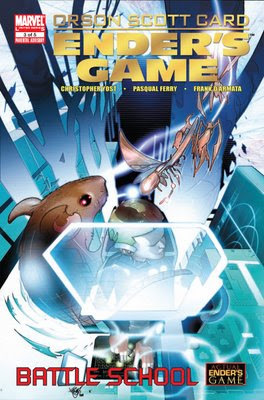 The book starts out with a depiction of a virtual game that Ender plays in which he must outwit a giant to gain access to a magical fairy land. This is essentially a metaphor for his journey throughout the rest of this issue, and the allusions to it work very well. Yost's handling of the script for this issue is much more deft and moves at a brisk yet satisfying pace. I'm also finally getting used to Pasqual Ferry's artwork, and I especially liked his depictions of the Giant's Drink game. After a great issue like this, I'm really looking forward to the future Ender's Game titles.